The Cleat Screw Kit that is keeping up with the latest developments from Speedplay®. These screws are specifically designed to work with Walkable™ and Aero Walkable™ Cleats. 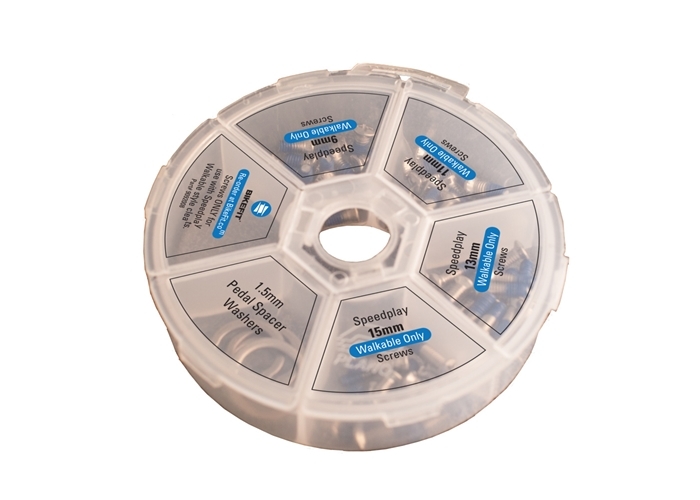 This round kit is easy to carry or stow and is a standard component of all Fitting Systems. The Cleat Screw Kit for Speedplay Walkable Screws is a BikeFit Pro's best friend when dealing with Walkable and Aero Walkable Cleats. The screws in this kit have thread lock compound added to help prevent them from coming loose.